The Strand & Pier project, a 100-room hotel and retail development proposed for the northeast corner of Pier Plaza, came before the Planning Commission for a first-look public hearing earlier this year. The project’s long term impacts are a source of endless speculation. Proponents say it is essential to rescuing Hermosa’s downtown businesses, while opponents say it will block views and smother small-town culture. Developer Bolour and Associates has laid out an innovative plan to build the massive project in an area with limited access but high demand by tourists and visitors. Among the more novel strategies is a plan to freeze the groundwater on the sight in order to dig a parking structure and lay the foundation. The method is almost certainly more environmentally friendly than the alternative of constantly treating and pumping groundwater into the storm drain, but it is also expensive and relatively rare in sites like this one. The developer will also pay for people to help deal with the flow of traffic in the area, but residents are concerned about the prospect of large numbers of trucks involved, as many as 80 trips to and from the site per day. There are only five streets in Hermosa that connect Pacific Coast Highway and the beach, and residents of 27th Street worry about plans to use their street as a pathway. Public comment on the project’s draft Environmental Impact Report ended in October, and the developer and consultants are now preparing responses to concerns from the public. Note: A previous online version of this story incorrectly placed an image of the rendering for North School, not the rendering of Strand & Pier, under this heading. 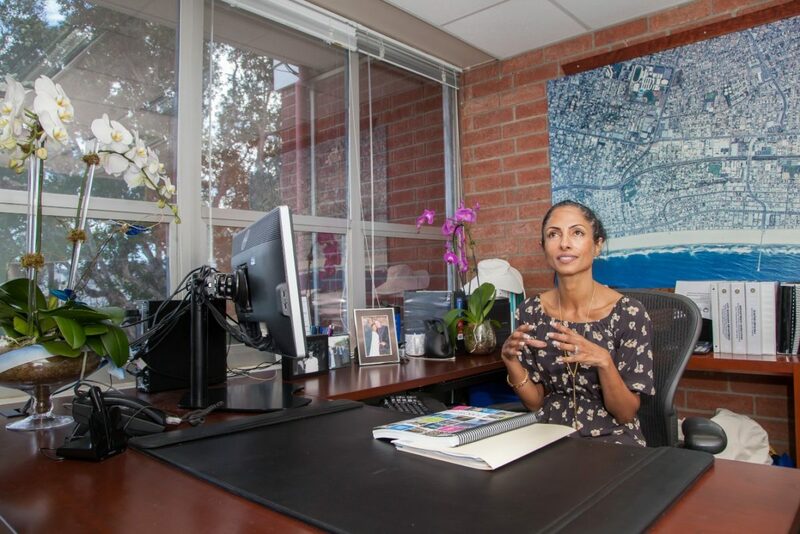 September of 2017 brought a new face to the dais at Hermosa Beach City Hall: newly installed City Manager Suja Lowenthal. Lowenthal came to Hermosa after stints in local government in various places and agencies throughout Southern California, both as a civic employee and as an elected official. Lowenthal follows former City Manager Sergio Gonzalez, who spent less than a year on the job. The city found Gonzalez after Tom Bakaly left to helm the Beach Cities Health District, and seemed like a fit for Hermosa. In meetings, he sometimes provided elegant suggestions to vexing problems, and he appeared to get along well with staff and elected officials. But, in announcing his departure earlier this year, Gonzalez said the lengthy commute to Hermosa from his home in the San Gabriel Valley was putting a strain on his wife and adolescent daughters. Shortly after his resignation became effective, Gonzalez became City Manager in Azusa, where his commute became about 20 minutes. Interim City Manager John Jalili guided the city after Gonzalez’s departure, as he did after Bakaly’s. Lowenthal emerged as the council’s unanimous choice. She most recently worked for the City of Santa Monica, where she focused on issues associated with the city’s airport and public transit agencies. She also has held elective office, serving on the City Council and school boards in Long Beach, where she lives with her husband and children. (Lowenthal commutes from Long Beach, a considerably less burdensome drive than the one Gonzalez left behind). Craig Cadwallader, head of the Surfrider Foundation’s South Bay chapter, had worked with Lowenthal before her appointment, and cheered the decision. “She’s smart, she’s efficient and fair, and I think she’ll do a great job as City Manager,” Cadwallader said. In March, Hermosa Beach officials held a late afternoon meeting to go over designs for a stormwater infiltration project slated for the area under the Greenbelt between Second Street and Valley Drive. The meeting at the proposed location was sparsely attended. But several residents from the neighboring Moorings townhomes stopped by. They did not like what they heard, and their reaction was the beginning of a vigorous opposition campaign that packed Hermosa’s City Hall like no other issue this year. The infiltration project is one of many called for under the Beach Cities Enhanced Watershed Management plan, an effort to bring cities into compliance with the federal Clean Water Act. The Greenbelt project would collect stormwater that would otherwise flow to the ocean in front of the Chart House and “infiltrate” it through the soil, gradually cleaning it and recharging the water table, an approximation of the water cycle before the region was covered in concrete. Bacteria level spikes created by stormwater regularly make the ocean unsafe after rainstorms, and the area surrounding the Herondo outfall, which the Greenbelt project would serve, regularly posts among the worst conditions of all South Bay beaches. Many residents were initially unfamiliar with the environmental benefits of the project, but eventually settled on a rallying cry: the project was needed, but it was in the wrong location. A large infiltration project directly in front of their homes, they said, posed quality of life issues, as well as potential long-term safety risks. Residents of the Moorings and other nearby homes and apartment complexes questioned why the site had been selected, and why Hermosa was being asked to carry so much of the environmental burden. This fall, the council agreed to try to renegotiate site selection possibilities with its neighbors, including Redondo Beach, whose City Council has formed a subcommittee to work with Hermosa. The Hermosa Beach City School District revised a portion of the Environmental Impact Report for North School in response to traffic concerns associated with the planned campus. The traffic controversy added to questions that the district has faced over Measure S, the facilities bond Hermosa voters passed in 2016 in an effort to address overcrowding in the district. Along with funding renovations to the existing campuses at View and Valley, Measure S is helping the district finance the reopening of North, a district-owned property that was shuttered in the late ‘80s. On Jan. 2 of this year, the last day on which to offer comments on the district’s EIR for North, the city of Hermosa Beach submitted a comment detailing what it characterized as several flaws in the district’s analysis of the traffic and parking impacts that would come from opening North School. The analysis had found that the opening of the school would not create “significant impacts” on the flow of vehicles at intersections surrounding the North Hermosa campus. The city’s letter attributed this conclusion to a failure to adequately consider the impacts of a concentration of cars at pick-up and drop-off times. Although the method the district used is the standard one for evaluating traffic impacts under the California Environmental Quality Act, it agreed to conduct a revised analysis, which was released at the end of the summer and broke down the flow of traffic into smaller time increments. That analysis did show “significant” traffic impacts. A consultant for the district cautioned that, although laws limited the district’s ability to count them in assessing traffic and parking, many parents would pursue “unofficial” drop-off spots that could ease the parking crunch. “There’s what people do, and what you sanction as a school,” said Placeworks associate principal Mark Teague. The school board will vote on the EIR at its first meeting of the year, on Jan. 9. For 2018, the Hermosa Beach Mural Project chose to honor the city’s contributions to punk rock and skateboarding. In the late ‘70s and early ‘80s, Hermosa was home to Media Art Studios, where Black Flag recorded their first release, and the Church, where the band and other punk luminaries lived and practiced. 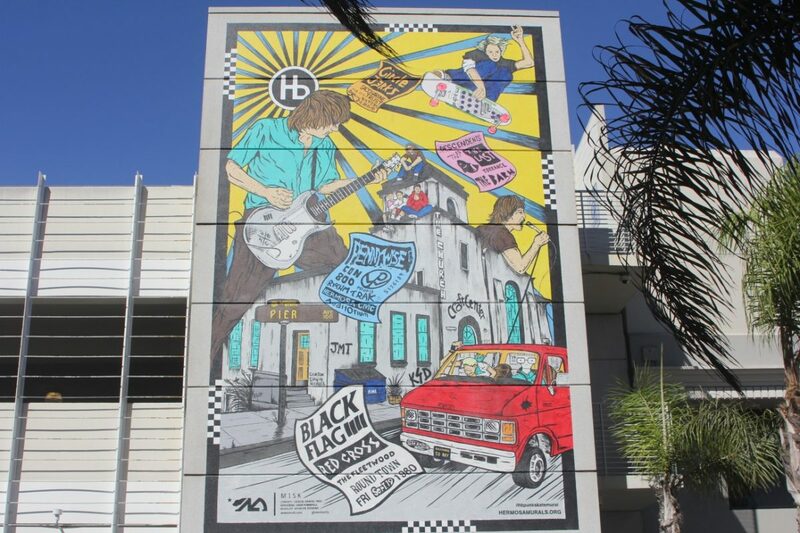 The mural, designed by local artist Daniel Inez and painted by Josh Kimbrel, depicts Black Flag founder Greg Ginn, along with iconography from the Descendents and the Circle Jerks. Flyers from past shows by acts including Pennywise and Saccharine Trust rain down, while homegrown skateboarding legend Mike Smith soars overhead. The mural went up in October on the south-facing wall of Parking Lot C, on 13th Street and Hermosa Avenue. The unveiling was the best attended of the eight murals the project has produced so far. Pennywise frontman Jim Lindberg, speaking at the dedication, said he was glad that it was not “some banker, or real estate developer or hedge fund manager” depicted on the wall. Instead, the mural features musicians, surfers and skaters, “and all the other so-called ‘delinquents’ who represent the real soul of this city,” Lindberg said. Alan Sanford, producer of the popular Hermosa Summer Concerts for nearly a decade, parted with the city this fall in an acrimonious dispute that has temporarily left the annual event series without a leader. Sanford began working with the city following the close of the city’s summer concerts in 2009, when reggae rockers Rebelution attracted a larger crowd than city officials had anticipated, leading some residents to worry about the safety of concerts bringing thousands of people onto the sand. Sanford struck a balance that has bedevilled other event producers in the city, making the beach concerts relevant and well attended while keeping them family friendly and locally oriented. He received a five-year contract extension that lasted through the summer of 2017. But when it came time to renegotiate, Sanford and the council reached an impasse over compensation. For the first time, Sanford sought a financial guarantee instead of just relying on sponsorship dollars. In return, the council wanted his financial information, which Sanford objected to providing for fear it would be shared with competitors. This month, Sanford announced details about Beach Life, a ticketed music festival he will be producing in Redondo Beach. Country music legend Willie Nelson will headline the event. Hermosa City Council members have promised beach concerts will still take place in the summer of 2019, and have issued a request for proposals from event producers. 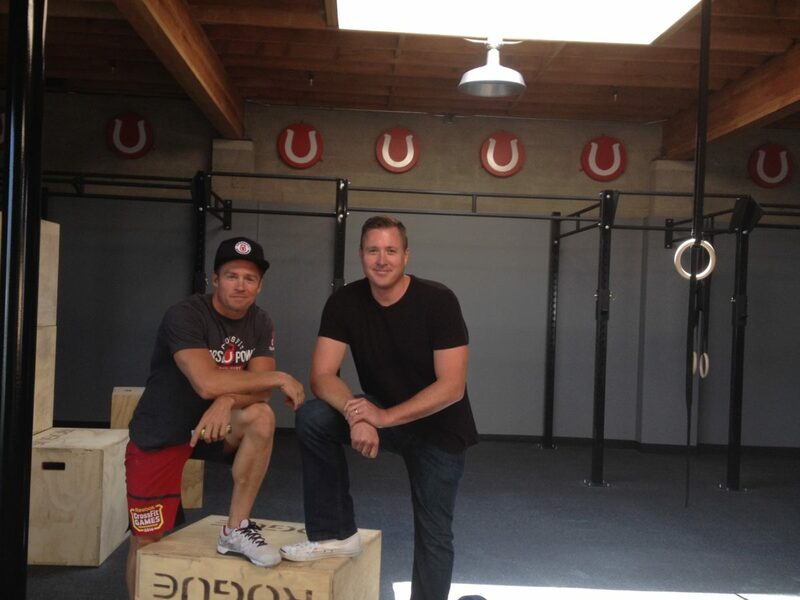 Hermosa Beach was sued in November by CrossFit Horsepower, a Cypress Street gym with a loyal following but which has also been the subject of years of resident complaints. CrossFit owners Jed Sanford and Dan Wells pointed to changes they have made to the gym in response to resident complaints over the years, including a ban on dropping weights, and said city code enforcement officials had yet to substantiate resident complaints with objective measurements. As detailed in the lawsuit, Sanford and Wells contend the nuisance proceedings were the result of bias on the part of the City Council. To support their position, they obtained emails from councilmembers they said show councilmembers frequently discussed the gym and proceedings against it with nearby residents. City Attorney Michael Jenkins said after the lawsuit was filed that there was nothing impermissible about the discussions or the city’s action. The complaint does not specify damages, but according to the lawsuit the city’s actions threaten the entire value of the business, which the suit claims is at least $1.3 million. Lazy Acres, a grocery store specializing in organic food and natural wellness products, opened in October of this year, winning over crowds of Hermosans and creating yet another option in the burgeoning battle for South Bay food shoppers. The Hermosa location is the fifth for Lazy Acres, which began in Santa Barbara and is owned by Bristol Farms. The store endeared itself to the local community with a pre-opening “apple biting” instead of a ribbon cutting and donations to local school districts. It also hosted a raffle for a dinner at a home on The Strand in Hermosa with big wave surfer Laird Hamilton, whose Laird Superfood products are carried at the store. Shoppers packed the store after it opened, with many drawn to its large selection of prepared foods. One customer, her arm in a cast, said that it had made preparing dinner easier. “It’s my first time in here, and so far, I’m pretty pleased,” the woman said. The Greater Los Angeles Homeless Count took place over a few chilly nights in January. As in years past, one of the teams combing the county to tally the number of homeless people left from City Hall in Hermosa Beach. Volunteers counted 23 homeless people in the city, a tiny fraction of the county total, but survey revealed how Hermosa and the reset of the South Bay is part of both the problem and solution to homelessness in the region. The total count, released May 31, revealed that there are more than 52,000 homeless people in Los Angeles County. This is far more than any other county in the country, and a significant increase from before the recession. But it also marked a slight decline from 2017, the first time the number had gone down in four years. Officials attribute part this decline to a growing interest from residents and officials to address the problem, including building more housing for those already homeless, and increasing affordable housing options for those at risk of becoming homeless. County voters passed sales tax Measure H to fund homeless services in 2017. Hermosa was one of dozens of cities in the county to receive funds to develop a plan to address homelessness, which the City Council passed over the summer. “This is the first time Hermosa has taken a step to address homelessness as a regional and local issue,” said Nico de Anda-Scaia, assistant to the City Manager. But the road will not be easy. In the late summer, several crimes and public disturbances allegedly committed by homeless people prompted residents to complain on social media. Police and other city officials held a forum to address rumors and concerns, and said the issue will require ongoing attention. California’s Legislature has passed a series of bills in recent years attempting to ease the state’s housing crisis. In 2018 they began to hit home for Hermosa Beach, in particular those regarding accessory dwelling units. ADUs, or “granny flats” as they are sometimes known, are units built in a backyard, garage or attached to an existing home. Because they do not require additional land to build, they are considered by state housing officials a promising way to build more housing in a state with notoriously expensive real estate. Recent state laws have required cities to update their municipal codes to make them easier for residents to build. Hermosa’s Planning Commission tangled with the rules in May, rejecting a first draft from staff as too likely to produce parking issues. They approved a second draft, which the City Council subsequently passed in July, 4-1. If fully implemented, the rules could allow for more than 1,500 new housing units in the city. The lone “No” vote came from Councilmember Justin Massey, who worried about the validity of the city’s parking provisions — the subject of complaints in the Planning Commission’s first crack at the ordinance. Recent statutes from Sacramento have minimized cities’ ability to impose parking requirements for ADUs within one half-mile of public transit but, like other cities, Hermosa’s ordinance defined “public transit” in a way that requires ADU parking everywhere. Officials with the state Department of Housing and Community Development have said that this is likely inconsistent with state law. Currently, the state does not have much power to check the city, but this too is likely to change as Sacramento tackles the issue. “There is a very aggressive movement in the Legislature to really take charge of housing at the expense of local control,” said City Attorney Michael Jenkins.